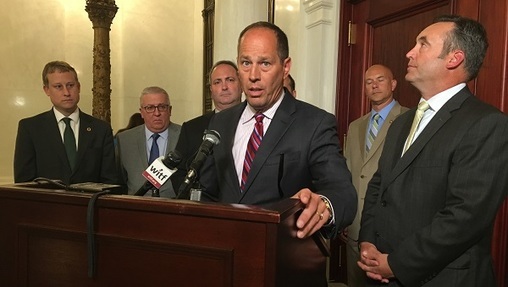 HARRISBURG, PA (WSKG) — After hours of debate, the state Senate has amended a high-profile redistricting overhaul, and is on track to send it to the House Wednesday. The bill has transformed dramatically since its inception–alienating some Democratic supporters along the way. But the most significant shift came Tuesday, as Republican lawmakers added a last-minute clause changing how the commonwealth chooses judges. Most debate on the bill was devoted to that amendment, which seeks to elect appellate judges by regional district, instead of statewide. If it passes, there would be seven Supreme Court districts, 15 for the Superior Court, and nine for Commonwealth Court. The amendment’s sponsor is Lancaster County Republican Ryan Aument, who said it’ll make representation in the courts fairer. “Five of the seven Supreme Court Justices–over two thirds of the justices–are from Allegheny or Philadelphia counties, leaving 79 percent of our state’s population underrepresented on our state’s highest court,” he said. The amendment passed on near-party lines. Democrats were outraged. Some, like Delaware County’s Anthony Williams, argued against the idea’s merits–saying judges shouldn’t have regional affiliations. “This notion that we want to be able to get closer to a Supreme Court justice, so they can have a glass of wine on a Friday, happy hour, go to Ruby Tuesday, hang out with all of us and be more common is ludicrous for those of us who want to protect the law,” he said. Aument countered that other established court systems–for instance, federal district courts–are regional by design. Other Democrats took umbrage to what they saw as Republicans retaliating against the state Supreme Court’s decision to redraw Pennsylvania’s congressional maps. Republican leaders deny any ulterior motives. Aument’s amendment aside, the newly-revised bill creates a redistricting commission of 11 citizens appointed by the legislature and governor. Each would have to be approved by a two-thirds legislative majority. If the commissioners are unable to agree on one of three map options, the task goes the General Assembly. If they reach an impasse, the state Supreme Court would pick one of the maps. Commissioners would have to be registered with their political party for at least three years. Current and former state and federal officials–and their employees–are banned. The judicial change and citizens’ commission will be separate ballot questions if they ultimately go before voters–so voters would be able to pick one without the other. But first, the measure needs to pass the House. Members there are still far from consensus on the issue.